I attended the opening celebration of Bait & Hook Seafood Bar, a newly revamped joint in Manhattan's East Village. It's reminiscent of a shanty by the sea--netting, apparently resting after having made the catch of the day draped from the ceiling, harboring starfish. A few lobster traps hung close by with Edison lighting suspended from above. Consulting Chef Dave Martin's new menu is fun and we set our course with a number of fat oysters from Long Island to start. Beer and wine flowed freely with passed hors d’oeuvres delivered to the bustling crowd. My friend and I navigated our way to two seats at the bar and dropped anchor--a kind bartender was quite attendant and helped us commandeer some of the seafaring fare! A Sicilian Villa Pozzi pinot grigio was a fairly marvelous pairing with the mollusks and my friend enjoyed the Argentinean Diseno malbec with a light acidity and notes of fruit. Chicken sandwiches served on a soft grilled bun went down the hatch, topped with what tasted like piccalilli-flavored pickles. Panko crusted cheesy mac with lobster arrived in a cast iron skillet shortly before a tray of scrumptious lobster rolls lightly dressed in drawn butter came out in grilled rolls. My friend went wild over coconut shrimp (I resisted) and tangy, moist fried chicken is seen below, served with sharp blue cheese dressing for dipping--and yes, another oyster. A neighboring fellow at the bar ordered a frosty pint of a Lagunitas IPA and I readily took the bait too, so fantastic, in turns bitter, fruity and floral with just the right amount of foam. The merry faux ice sculpture anchoring the bar--it's a little blurry but since we were all packed in like a tin of sardines it wasn't exactly easy to take a picture! Thanks to Shari Bayer for the invite! Bait & Hook Seafood Bar is located at 231 Second Ave (@ 14th St), New York, NY, 212-260-8015, BaitAndHookNYC.com. Chapter One, a "New American" restaurant, just opened in Manhattan's cozy West Village. The pub vibe is elevated casual-cool with operating partner Damian Collins and Warren Baird (formerly Esca in Hell's Kitchen) in the kitchen as Executive Chef. A mural of the location circa 1910 lines a wall, accented with Oxblood banquets and pewter-topped dining tables and enough windows to be perfect for people-watching. Classics such as duck confit, celery root, and steak tartar co-mingle with Western European influences, yet remain solidly American, made with local meats, seafood and vegetables. Lingering at the bar, poring over cocktails (featuring a lot of American whiskeys) is most definitely permitted. Sample malt-vinegar chips and pork rinds while at it--or sidle over to a table for something more substantial such as oyster chowder with cream, Swiss chard and a soupcon of dill oil for a starter, and crispy chicken in sorrel butter sauce or pork belly with chorizo-apple pudding for mains. 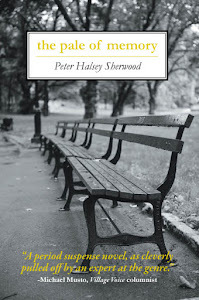 Chapter One is located at 33 Greenwich Avenue, New York, NY 212-842-9146, ChapterOneNYC.com. The Urban Tech Gala Celebration honors the charity that has supported youth and community through technology for 19 years now, connecting students and families to digital literacy, comprehensive health education, and life skills. The lineup of luminaries includes John Starks, Hill Harper, Maurice Dubois, Alicia Quarles, and Mel Debarge--of course, make a racket with award presenters Billie Jean King and Lou Gossett! Check into the VIP cocktail party at 6pm, followed by the dinner and awards ceremony, and a silent and live auction. Maurice DuBois, award winning anchor of CBS 2 News This Morning and the weekend edition of CBS Evening News, will serve as the Master of Ceremonies for the evening alongside E! Entertainment News' Alicia Quarles. Three Sixty.com, located in New York's TriBeCa neighborhood, plays host to the event. And yes, you guessed it, there are 360-degree views of the city. For more info, tickets, a peek at the online auction, and some of the experiences you can bid on during the evening, go to UrbanTech.org. This picture of lobsters is of my own lobsters cooked in Maine, found here, not actually from Luke's Lobster, but the restaurant's offerings will be on hand at The Governors Ball Music Festival, to be orchestrated from June 6 to 8 in Randall's Island Park. 2014 attendees can sample food from more than 50 vendors. A partial list of participants include VIP only Pok Pok Ny, Calexico, Go Burger, Hill Country BBQ--but among the other vendors, such as L'Artusi, Crif Dogs, Momofuku Milk Bar, Pizza Vita and The Taco Tent, their stands are wide open for all. Musician Jack White promises to rock the park while the rest of us have the opportunity to loosen our belts and taste cuisines that span the globe. P.S. 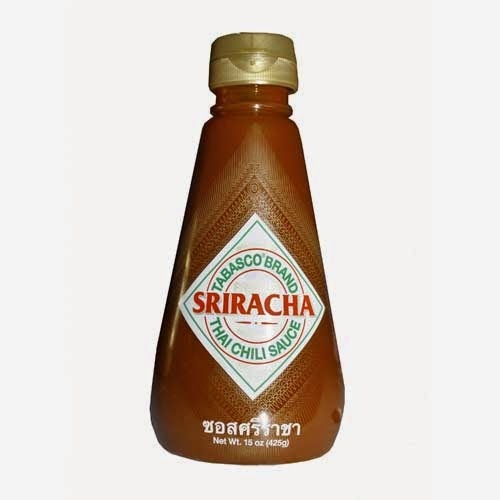 Tabasco now has its own brand of sriracha sauce, perhaps to be used for pork sliders with sriarcha aioli (the progress is seen above). Just sayin'. Celebrate the start of summer with the launch of "Out @ Sea" commandeered by Manhattan by Sail. 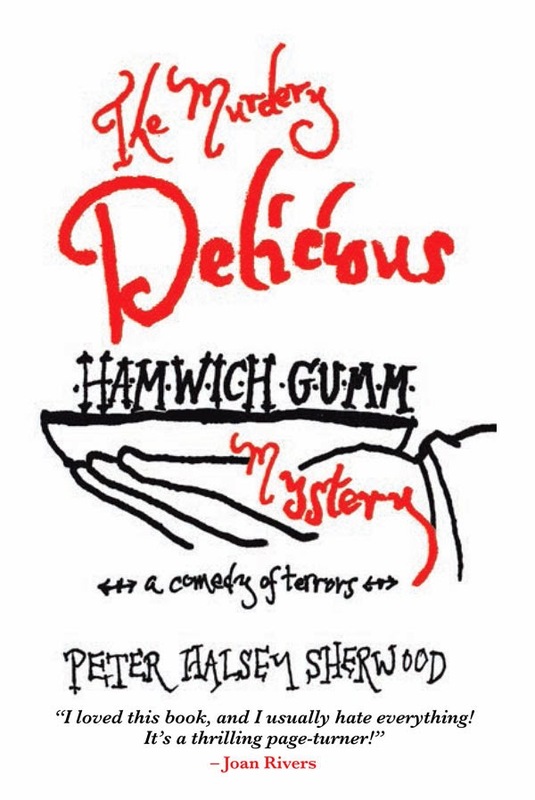 Starting this Sunday, May 25th at 9:45pm, on a dock in Battery Park, there floats a full bar, jello shots, pickle backs, and drink specials! The two hour party for adults (over 21) embarks for a seaworthy fee of $27.00. Other Sundays of each month continue with Gay & Lesbian nights aboard the Clipper City Tall Ship. Sip some cocktails and kick up your heels out on the waters this weekend with DJDH (also known as Megosapollos) navigating the music. 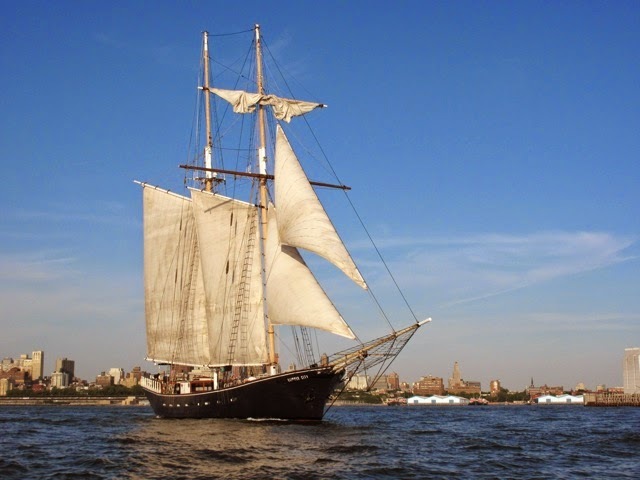 Enter code MBSFFOS14 for a discount when you visit ManhattanBySail.com or call 212.619.6900 for more info. I was so inspired by a page in a Williams-Sonoma catalog that I planned a simple, casual cocktail party on a Sunday afternoon for a handful of guests, featuring nips of vodka, a bottle of highly appropriate rose wine and a trio of latkes with various toppings. Pink candles radiated from a shimmering candelabra as a Burleigh ware pitcher filled with blue hydrangeas and a vase of fragrant spring lilacs looked on. These recipes from reliable W-S are great and resulted in the latkes being devoured readily. I also added some canapes with goat cheese and onion marmalade to further the platters. Above are the latkes with beet relish. Much was prepared ahead and to save more time and effort I purchased beets that were already cooked and only had to chop them. They marinated for a few hours in balsamic vinegar and olive oil and then sat on a soupcon of creme fraiche (not the suggested sour cream) with sprigs of curly parsley. It hardly seemed necessary to go through the hassle of grating zucchini for the next dish so I improvised and snipped the heads off of microwave-ready asparagus spears instead. I subbed a gentle gorgonzola (that was already crumbled) for the suggested feta cheese, sprinkled micro basil over it and drizzled a little basil oil as well. Seen below in preparation! Canadian smoked salmon swam upstream with creme fraiche and instead of a (possibly expensive!) mix of parsley, chervil, tarragon and dill as the recipe suggests, I thought to use micro wasabi, in a riff of what might be found on a tray of sushi. A simple arrangement of butter leaf cookies on an elegant coupelle! My friend and I trekked downtown to Tribeca to sample some of the best food the neighborhood has to offer at the Taste of Tribeca food festival. We had a deliciously wonderful time--but it was no place for children, even as there were scads of them. The streets were packed with visitors who had purchased tickets to the event and we all had to navigate around babies in high-end strollers outfitted like mini-vans and little kids strolling past on scooters. Still, it was of little matter: everything was a ball. Nobu and Pepolino sold out immediately but we carefully considered our road map to check out the other participants (close to 100!) as we made our way through and chose wisely to sample some of the small plates that the bustling chefs prepared during the gloriously bright and sunny afternoon. Seasonal ramps from Telepan Local were first up for us, with asparagus, wild garlic, lemon ricotta and sorrel. Two pieces of seared foie gras "sushi" from Daruma-Ya were pretty great and we chugged thirst-quenching lemonade from Dirty Bird To Go while we waited in line (fortunately we were first for the new batch) for truly scrumptious buttermilk-dipped chicken nuggets that everybody was clamoring for, and rightly so. The fantastic jazzy blues quartet rocked the pavement...! Alaskan King house-cured salmon from Landmarc was perfection, served in a considerate vessel with pickled onions and creme fraiche with mustard seeds; the aroma of sherried shrimp and crab meat with shallots stuffed into homemade tortellini led us to Acappella restaurant's stand; divine deviled eggs from The Butterfly fluttered about; crispy shrimp from Megu filled a temaki handroll; Bouley tickled our taste buds with Japanese a root vegetable kuzu chip topped with an aligot whipped potato and cheese preparation topped with black truffle pate, alongside a raspberry cherry amaretto white chocolate mousse; and classic Apple Brown Betty from Bubby's Pie Co. finished us off--well almost, because we went for a apple and lemon popsicle from Ward III as well. Taste of Tribeca was quite tasty indeed! Thanks Bayer Public Relations for the invite! Surely you remember how tiresome it was when you were a child and any speaking relative could tell you to eat your vegetables. Well, spring into summer as we have here a recipe for a whole roasted head of delicious cauliflower in a yogurt marinade as well as a tasty dish of fresh fettucine with morels, asparagus, and peas! I adapted the recipes here and there, as one does to suit the individual taste, and I found the following two dishes to be quite good. So did my guests! PureWow.com served up Spicy Whole Roasted Cauliflower, the link found here. I bought prepared tzatziki to sub for the yogurt marinade and it worked just fine. Add in the suggested chili, cumin, garlic, and curry or more to make it as spicy as you like. Epicurious.com provided the fettucine recipe via Bon Appetit, and I adapted the recipe that may be found here. I did much more tinkering with this one, adding in about a cup of frozen peas that I cooked and tossed in at the end. I readily roasted the asparagus in Persian lime oil (extra-virgin olive oil is fine of course, or even a spritz of lime juice) instead of boiling the stalks, as the recipe suggests. The fettucine was fresh (not dried), I skipped the snips of tarragon because we didn't have any on hand and used fat-free condensed skim milk instead of whipping cream--we didn't even notice the lack of fat! And as hideous as the morels may appear, they are so sumptuously fragrant and spongy and really make the whole dish. 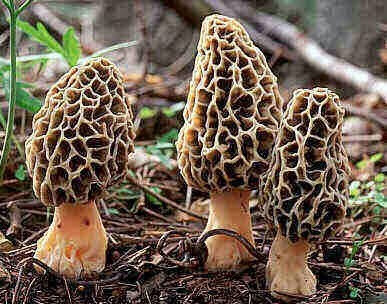 Thanks PhoenixTools.org for the picture of the morels! Wonderful! The re-imagined Tavern on the Green has undergone a total re-do--I hardly recognized it--and I'm happy to report that the old New York City classic has been dusted off and shines merrily into the stratosphere. 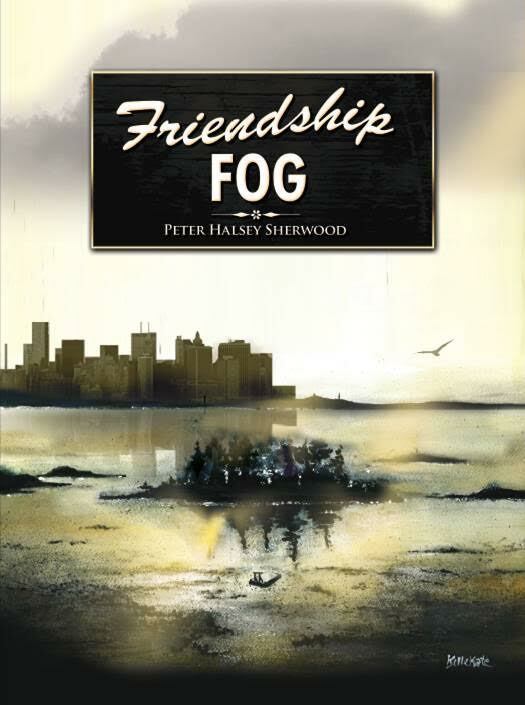 This new journey, after a brief closing, is modernized and vastly different, while still paying homage to its highly historied, deeply steeped past. And the environment actually feels like a cozy tavern now, and locavore cookery is helmed by Katy Sparks, some of which I sampled. I practically hyperpalpiventilated at the grand reopening; I was so overwhelmed and it is only on rare occasion that I am whelmed at all. Martha Stewart swooped past me, Regis Philbin was spotted at the bar and I chatted with the divine Fran Drescher by the stunning new fireplace. Ms. Drescher, currently starring in Cinderella is such an amazing, incredibly gracious lady who gently held my hand as we spoke together. It was a grand night for singing as well with legendary Marilyn Maye, who I have had the absolute pleasure to meet before. The jazzy songstress (who had the most appearances on Johnny Carson) held court in the shimmering, dangling lamp-lit courtyard, slaying the crowd with a few numbers accompanied by Billy Stritch at the piano. How we all longed for a few more songs--it was all brilliant. Later, as the bar that anchors the space became somewhat of a cabaret, I found the nerve to get up and sing with Billy Stritch as my accompanist and a fantastic trumpet player to send it all soaring. Imagine? I did pretty well and what a thrill--I floated all the way home in the cab! Bustling barmen pouring prosecco and creating cocktails for thirsty elbow-benders! The chefs were hard at work too, of course, serving up a range of things including quail, smoked salmon and caviar, blue corn chips with guacamole and salsa and filet mignon from the open kitchen. More cocktails poured, out of doors! What a swell party it was! Congratulations to Tavern on the Green and thanks to Hall PR for the invite! 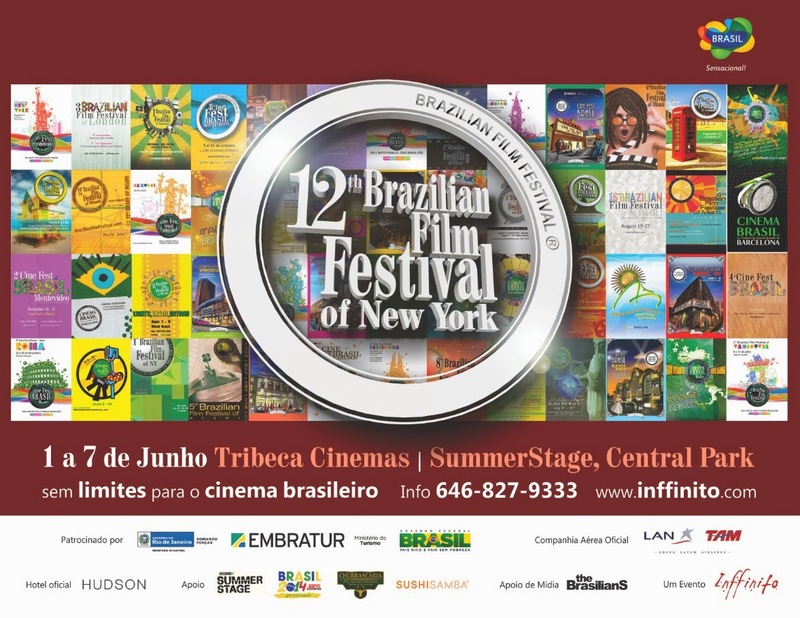 The 12th Brazilian Film Festival of New York includes the Taste of Brazil, honoring the diversity of Brazilian ingredients and cuisine with Brazilian dishes and cocktails that will be offered on their menus throughout the week of the festival. 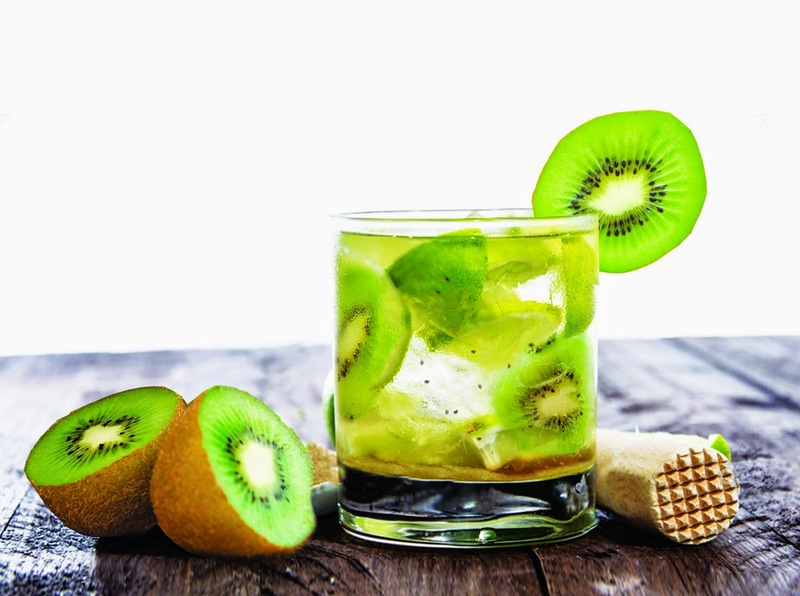 Participating restaurants include: Plataforma, SUSHISAMBA (their Kiwi Caipirinha is shown above), Cantine Parisienne, Emporium Brazil, Los Americanos, Organika, Jacques 1534, The Diner, Botequim, Tablao, Gradisca, and Rice & Beans. For more info, go to Inffinito.com or to get tickets, click here for the direct link or go to TicketWeb.com. Eolo in Manhattan's Chelsea 'hood is hosting a Sicilian "Feast for the Senses" this Sunday, May 18th, between 3-6pm. Melissa Muller Daka, who helms the restaurant, will be celebrating a much anticipated spring with Sicilian-inspired dishes that include antipasti, pastas, entrees, desserts and a three hour open bar with Sicilian wines, all served table-side. Live Sicilian folk music by Allison Scola and her group Villa Palagonia will set the tune for the afternoon. Go to EoloNewYork.com for more info; for reservations, call 646-225-6606. 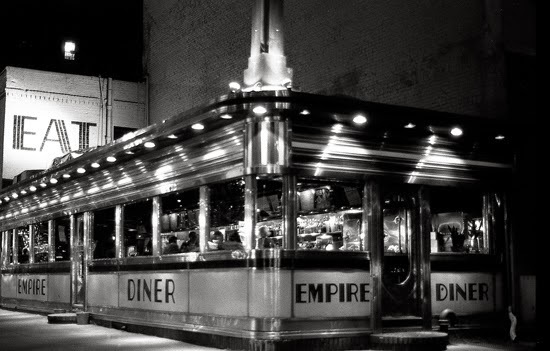 In en plein air news: New York magazine's online Grub Street feature created a list of where to eat out of doors (such as Amanda Freitag's Empire Diner) that I found to be most newsworthy. The link is here. Take a deep, fresh breath and do enjoy! Apparently there was a lime shortage sometime this year and thusly smote the enhancement of many creative libations. Word has it that the price of limes reached a fever pitch and many elbow-benders had to go without. 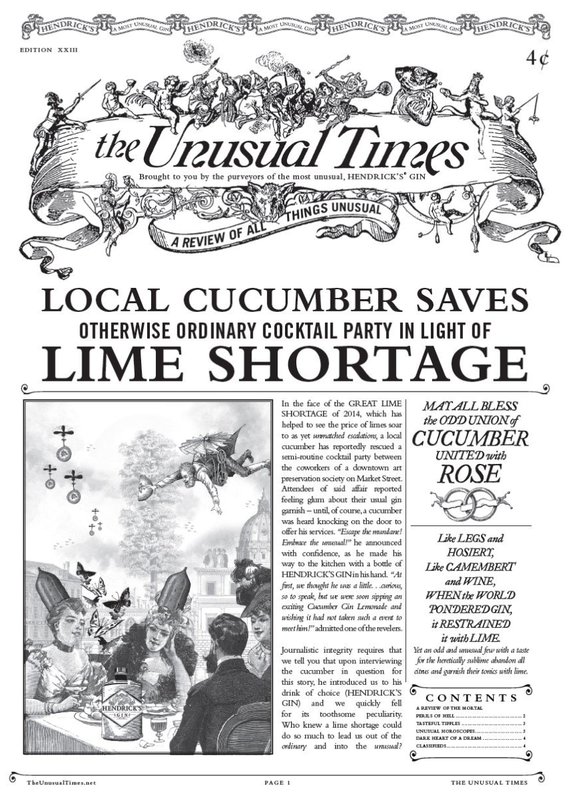 So heed these words now of barkeeps most everywhere with their motto: "Save a Lime, Use a Cucumber." 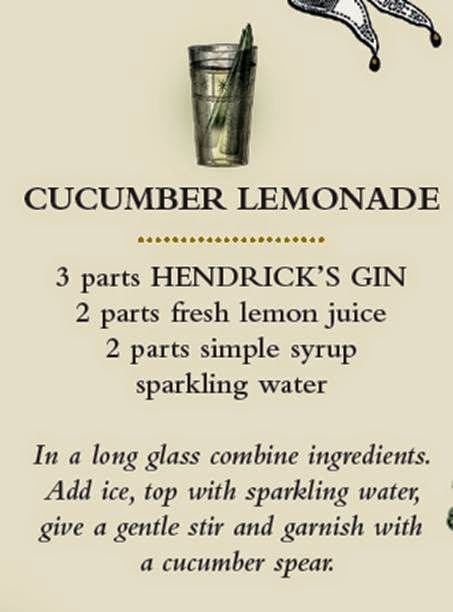 Where else better to start than with Hendrick's gin? Flavored with cucumber, rose petals and a blend of botanicals, it is easy to swap out a G&T and lime wedges with this cooling Cucumber Lemonade cocktail that incorporates cucumber spears. So ideal for the warmer months (recipe below). Please save the limes--and remember to consider the cucumber! Please use your cukes responsibly. Mother's Day is coming up May 11th already! Savoury, a recently arrived Indian restaurant on Manhattan's Upper West Side offers an easy (and incredibly cheap) Mother's Day Three Course Brunch for $20. Chef/owner Lala Sharma's (formerly of the delicious Surya) menu influenced by Western and Southern Indian cooking. Try appetizers crispy cauliflower tossed about in tangy garlic tomato sauce, or chaat, crispy wafers served with onion, potatoes, yogurt, tamarind and mint sauce. 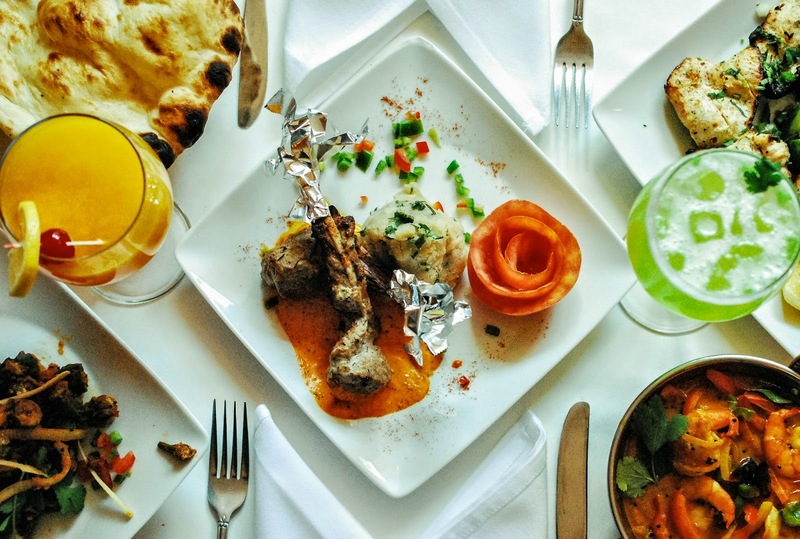 Main courses (served with naan, basmati rice, and cucumber raita) include buttery chicken tikka cooked in the tandoor oven and enveloped in a tomato cream sauce; lamb or goat is cooked with crushed black pepper, curry leaves, tamarind, and coconut milk. Finish it all off with traditional Indian ice cream--and all mothers will also receive a complimentary mango lassi! 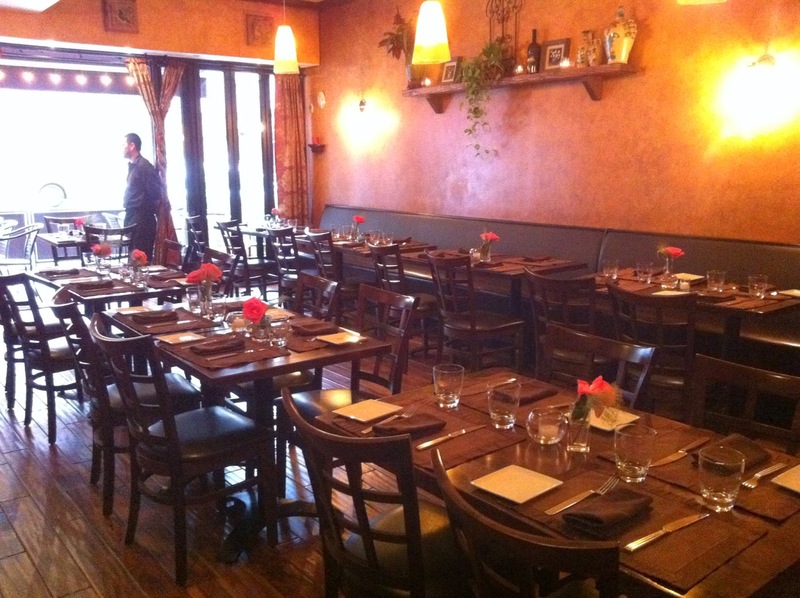 Savoury is located at 489 Columbus Ave, btwn 83rd/84th Sts, 212-875-1400, SavouryNYC.com. 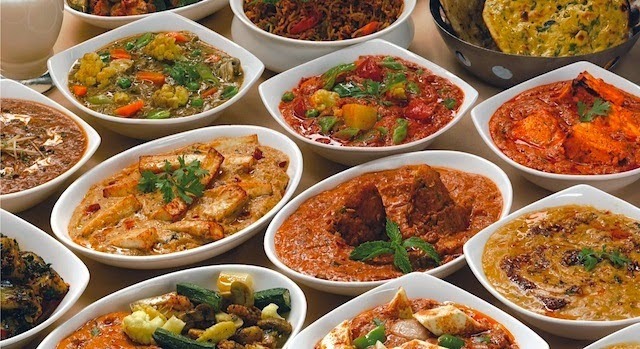 And while at it, in the mood for more Indian food? 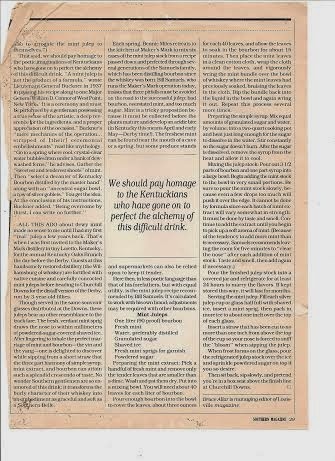 Here we present the opening of the first authentic Sindhi restaurant in New York City's Curry Hill, featuring vegetarian Indian cooking. The Mulchandani brothers opened Kailash Parbat in Bombay in 1952. Since then, 28 additional locations have opened in Chennai, Kochi, Surat, Bangalore, Hyderbabad, Singapore, and London before landing in Manhattan. Everything is made in house daily, down to the freshly ground garam masala spice blend and when a recipe dictates, they import ingredients straight from India. Look for puffed rice mixed with chickpeas and tamarind and cilantro chutneys, saucy savory cakes and fried Indian breads with curried chickpeas to get started before trying gingery mint and spinach paneer, Indian cheese, and dishes of yellow lentils flavored with cumin and garlic as well as other Indo-Chinese, traditional Sindhi and tandoor dishes. Kailash Parbat is located at 99 Lexington Ave, between 27th/28th Sts, 212-679-4232, KailashParbatNY.com. Now for an entirely different taste, Michaels of Brooklyn is celebrating its 50th anniversary this year and to amp up the occasion, they are launching a cooking contest on Facebook. The winner will receive a free case (6-32oz jars) of their house-made authentic Italian tomato sauce. 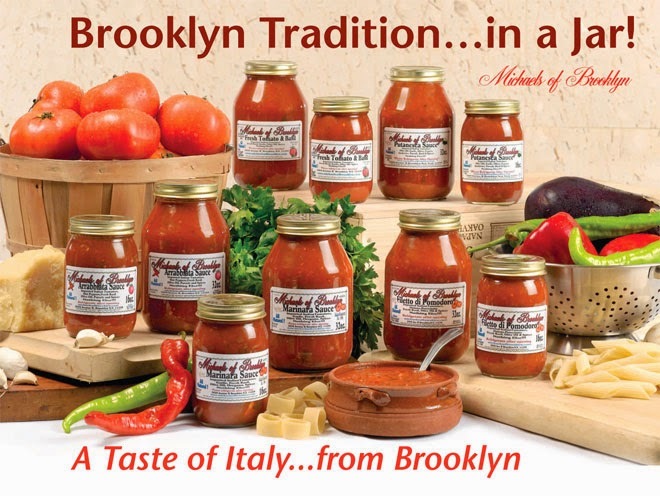 Here's what to do: “like” the Michaels of Brooklyn Sauce Facebook page, post your favorite recipe, using any flavor of Michaels of Brooklyn sauce such as marinara, puttanesca, arrabbiata, home style gravy along with a photo of the dish. Entries will be judged on originality, the photo, and how many “likes” and "shares" it gets. Send as many recipes as you wish before Friday, May 23 at 5:00pm EST. The contest is already live, and the Facebook page can be accessed here: https://www.facebook.com/mobsauces. The winner will be notified via Facebook before or by May 30. I was fortunate enough to celebrate the opening of Back Label Wine Merchants and gourmet market Stinky Bklyn (directly next door) by attending their New York City splash in the Chelsea 'hood. Husband and wife team Patrick Watson and Michele Pravda are gleefully offering hand-picked foods and a library of well-curated wines stocking the shelves along with small batch spirits--and boy, do they have a lot of wine stocking those considerable shelves! Food Matters was so generous to donate the food and I sampled superb Salami Felino from New Jersey, smoky Larchmont bresaola, La Tur cheese (which I have heard aptly dubbed as "the ice cream of cheeses") and rich, fruity green olives. I was particularly enamored with the delicious Domaine de Valensac chardonnay that came from the Pays Doc region of Southern France. The bluesy-prohibition jazzy acoustic trio The MilkMan & Sons set the great score for a wonderful evening. 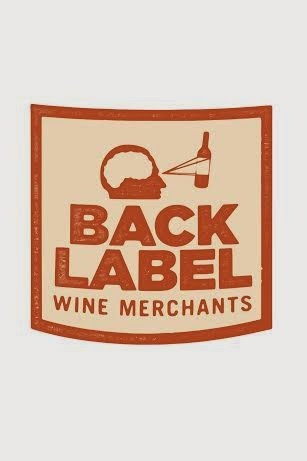 Back Label Wine Merchants houses a custom-made bar along the back wall of the soaring space to create an "educational space" where a number of classes will take place with subjects ranging from wine and spirit tastings to events and seminars. A 20-foot centerpiece reserved for wines $20 and under anchors the whole thing. Stinky Bklyn features a list of meats and cheeses that delivers delights from across the globe and it also pays homage to Stinky's home base in Brooklyn with a special section featuring a selection of roasted coffee, donuts, pickles, breads, chocolates and condiments as well as craft beer growlers on tap. We'll drink (and eat) to that! Cheers then to Patrick Watson and Michele Pravda! Back Label Wine Merchants is located at 111 W 20th St, NY, NY, 212-229-WINE (9463), BackLabelWine.com; Stinky Bklyn is located at 107 W 20th St, NY, NY, 212-243-CURD (2873), StinkyBklyn.com. And we're off, once again! This year marked 20 years of going to and throwing Derby parties--and I don't mind telling you, my my, how a party can wither one. This was rather more the warhorse of the roses. We didn't have a huge crowd this year, there were just about ten of us but among the usual Benedictine sandwiches and tomato and biscuits and fabulous pimento spread (that a wonderful guest brought), while trying to make my shrimp and grits, one of our guests fainted quite away and then I discovered an unexpected, climbing army of marching ants on the bedroom wall that had to be attended to as well. I was so distracted I forgot to put the bacon that I had already cooked and crumbled in the shrimp and grits! After receiving the delivery from Fresh Direct, I prepped all day on Friday doing what I could ahead of time including setting the table and as much as I had done I never had much of an opportunity to sit down on Saturday and enjoy my own party. My calves still hurt from standing for the last two days. This year's event is also sort of a Bon Voyage: Baby is going to Chicago for work for a month before we go to Spain to celebrate our one year anniversary of marriage in Barcelona and Sitgez on the beach. We're taking my mother for her 80th birthday and we'll also visit my niece as she is studying abroad in Valencia. A colleague sent me this mint julep recipe below from Southern Magazine (now defunct). It took some time to make the mint extract and simple syrup before it commingled with the bourbon and rested in the refrigerator overnight. I should have climbed in with it. A large Mason jar was our charming vessel and we made just the right amount. Warning though, it is a strong drink! As I've always maintained, a mint julep is the wicked mistress of the South, that will coddle you through an afternoon and then beat you into submission by midnight. But oh, such sweet blindness! We made Grasshopper Mousse and a guest brought Derby Pie for dessert. In a wild fit of pique Baby and I made a version of classic Rice Krispie Treats that we called Kellogg's Kaos Bars, using all six little boxes of the Snack Pack cereals that we had on hand that added up to the six cups needed for the recipe: this included Cocoa Krispies, Corn Pops, Froot Loops, Apple Jacks and Frosted Flakes. After melting the requisite marshmallow minis in butter, all the cereal went into the mix and then cooled before we cut our amalgam into bars and stacked them on a platter. It sounds ghastly perhaps but our guests delighted in making short work of them indeed. The regular Rice Krispie recipe is here. This years roses, delivered by a kind friend (who couldn't attend) on Friday! So, off we go and cheers then! Making this chicken was an interesting adventure. But what venture into the kitchen isn't? Baby actually smoked the chicken in our smoker, which made it a little dry but the flavor was certainly good and worth trying again. The next time, we both agreed that instead, we'd like to adhere to the recipe which calls for roasting a whole bird in the oven; we used two frozen chicken breasts that we already had. However, the recipe does not list an oven temperature--let's say 400 degrees is a good bet. The best part was that we had all of the ingredients on hand and didn't have to leave the house on such a lazy afternoon. A quality tea is essential, I think, for this, and Samovar's Earl Grey Black was highly appropriate. Also, live a little and add more soy sauce and sesame oil than the recipe suggests. The preparation and ensuing method is very easy--and surely any guests you may have lingering about will find the exotic aromas, suggestive of old world tea merchants, to be most alluring, as they waft out of the kitchen. Do enjoy! And thank you OnFoodAndWine.WordPress.com!